As I discovered, the first point has already been remarked upon in earlier papers by others. The second point about small interannual variability arguably follows from the first given the opposite seasons in the two hemispheres. I don't know if the buffering argument will hold as more ice melts, or whether there'll end up a hemispherical imbalance over time. (There are papers looking at what happens as CO2 increases, which I haven't covered here. Also, see the section on the southern hemisphere below). The particular beef Willis has with the paper isn't about either of those points. He is complaining about a chart showing the fluctuation in albedo over the year, as Figure 5 below (click to enlarge it). 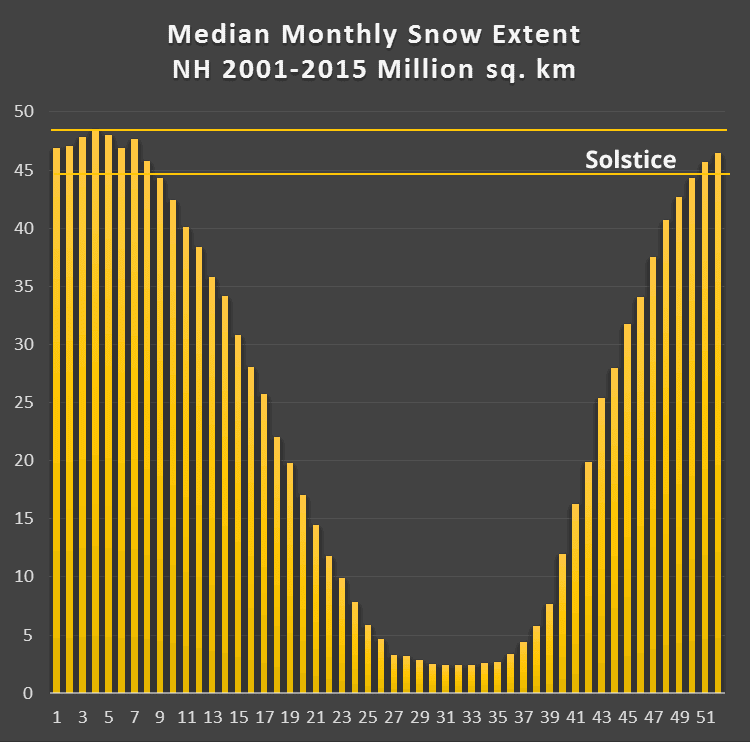 This seasonal cycle behavior is set in part by the seasonal cycle of surface albedo which has a boreal spring-time maximum resulting from the reflection off the brighter snow-covered land surfaces between 30°N and 60°N (Figure 5c). The second weaker maximum in the boreal fall season is influenced by reflection from midlatitude clouds of the SH (Figure 5b). The paper is a fair coverage of the topic of albedo, if you are interested in the subject, as Willis is. The maximum albedo occurs on the summer and winter solstices in December and June, when one of the poles are maximally pointed at the sun. At that point, the most ice-covered area is exposed, which makes for a high albedo. In addition, because the snow- and ice-covered area is much larger in the northern hemisphere than in the southern, the December albedo is higher than the June albedo. And on the other hand, on the equinoxes the sun sees mostly ice-free zones, and so the albedo is lowest around March and September. In December, a large part of the snow and ice in the northern hemisphere is dark. It's also the shortest day of the year. In June, there's little snow and ice in the northern hemisphere. In the southern hemisphere, the sun doesn't do much - it's dark over much of the Antarctic ice. The maximum snow and ice coverage in the northern hemisphere is late winter, early spring - late January to early March. 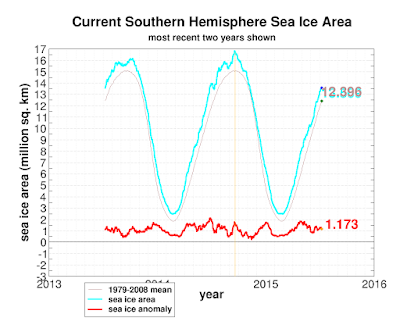 The maximum southern sea ice coverage in the southern hemisphere is in September (~17 million sq km), the minimum in February. In December it's around 7 million sq km. The maximum Arctic sea ice extent is in March. The interannual variability of top-of-atmosphere (TOA) irradiances observed by Clouds and the Earth’s Radiant Energy System (CERES; Wielicki et al. 1996) instruments is remarkably small. Four years of CERES data from March 2000 through February 2004 indicate that the annual and global mean TOA reflected shortwave irradiance is 97.0 W m22, with maximum and minimum values of 97.2 and 96.8 W m22, respectively. The difference between the maximum and minimum values is 0.4% of the mean value. 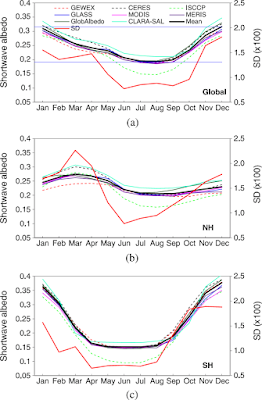 Global albedo has a distinct and repeatable seasonal cycle. 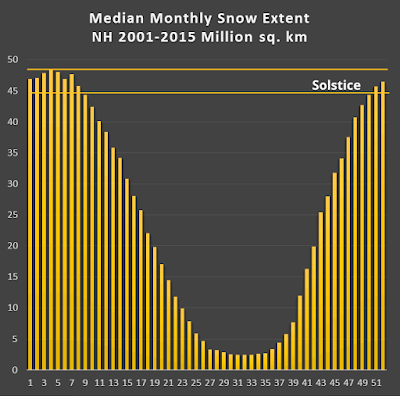 Because of the tilt of the Earth’s axis and the large surface albedo of snow at high latitudes, it reaches maximum values during the solstice months and minimum values during the equinox months. 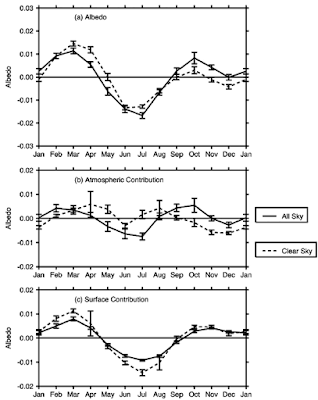 Changes in cloud and surface properties from year to year introduce slight variations in the seasonal cycle of albedo, but these perturbations are much smaller than the basic seasonal cycle of albedo. As a minimum, therefore, any approach that attempts to measure subtle changes in the Earth’s albedo must be able to characterize the broad features of global albedo changes with season. Monitoring changes in the Earth’s SW TOA radiation is critical for understanding climate. However, because of the spatial and temporal scales involved and the need to account for radiant energy across the entire solar spectrum, it presents a significant observational challenge: all methods that attempt to measure the Earth’s TOA radiation suffer from sampling errors due to inadequate spatial, temporal or spectral coverage. ...Simulations of lunar Earthshine measurements show far less variability than those observed from the ground by Palle´ et al. , but still show 4–5 times the variability observed from CERES global data. Furthermore, while CERES global albedos exhibit a well-defined seasonal cycle with albedo maxima and minima occurring at the same time each year, the seasonal cycle in lunar Earthshine reflectance simulations is highly variable and out-of-phase from one year to the next. Radiative transfer model (RTM) approaches that use imager cloud and aerosol retrievals reproduce most of the change in SW TOA radiation observed in broadband CERES data, but the assumptions used to represent the spectral properties of the atmosphere, clouds, aerosols and surface in the RTM calculations can introduce significant uncertainties in annual mean changes in regional and global SW TOA flux. Such uncertainties can cause interannual anomaly errors ranging from 1% for global ocean to 2% for global land, much too large for climate change decadal signals. Let me point out that in the acknowledgements, Stephens15 makes it clear that Norman Loeb (of Loeb07) provided input into the paper. So there might not be any discrepancy between the two papers. However he wasn't one of the authors so he can't be held responsible for the content. ...atmospheric albedo also shows a small seasonal variation over all regions. It is smaller during spring and summer than winter and fall. 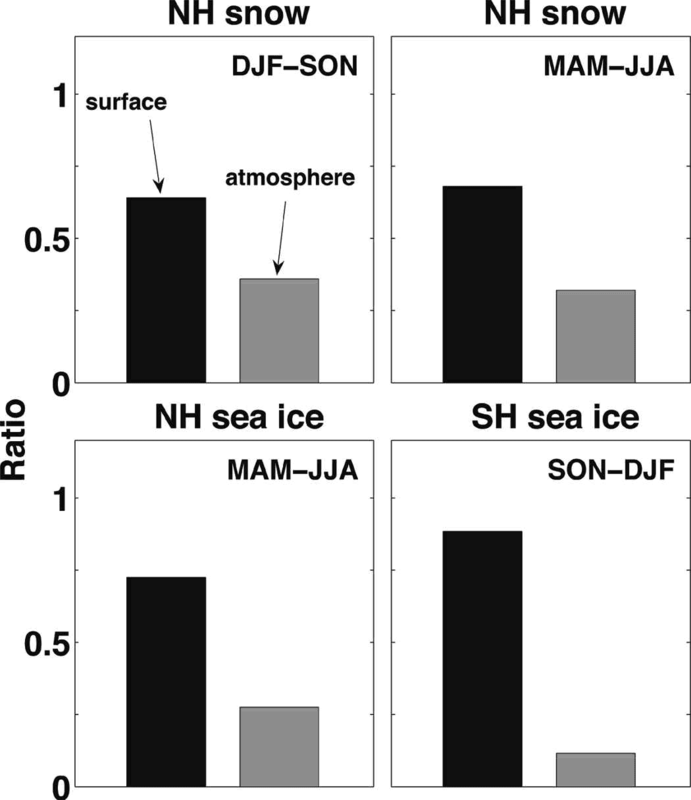 For example, atmospheric albedo in NH snow-covered land areas is larger in DJF and SON than MAM and JJA. This difference is almost certainly associated with seasonal variations in the position of the earth to the sun, represented by solar zenith angle. Larger zenith angles during winter and fall in high latitudes increase the optical path of incoming solar photons, thus enhancing the albedo of the atmosphere. 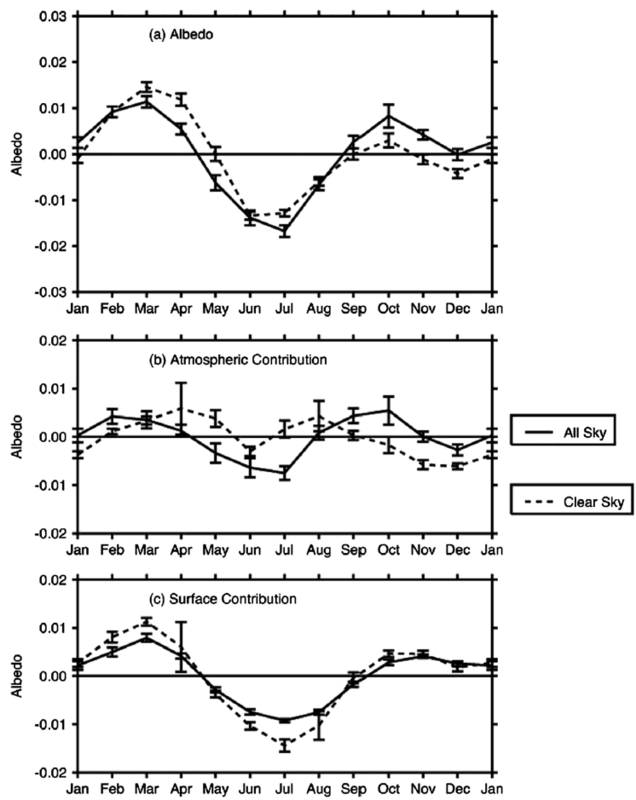 In addition to looking at transmissivity of surface albedo (how much SW gets out to space through the atmosphere), Qu and Hall found that surface variability over the annual seasonal cycle is different to planetary variability and attribute the difference to cloud cover (ie clouds themselves reflecting the sun back out). Here is a chart showing the contribution to seasonal change in planetary albedo of surface and atmospheric albedo in the polar regions. Although not strong enough to prevent the surface from dominating planetary albedo variability, the damping effect of the atmosphere significantly attenuates planetary albedo variability generated by surface fluctuations. For example, the magnitude of interannual planetary albedo variability in the cryosphere regions is about 10 times smaller than the magnitude of interannual surface albedo variability. This damping effect therefore partly constrains the strength of surface albedo feedback. Moreover, because this effect tends to vary seasonally, it may also contribute to seasonal variations in the strength of surface albedo feedback. For example, effective transmissivity is greater during spring than fall in NH extratropical land areas, implying that a snow albedo anomaly in NH extratropical land areas results in a larger planetary albedo anomaly in spring than fall. This is probably another reason why snow albedo feedback is stronger in spring, together with two other well-established reasons: extensive snow extent and relatively large solar radiation (e.g., Robock 1980; Hall 2004). Looking at different papers can be quite confusing when it comes to albedo. Albedo comes in several flavours - surface, atmosphere, surface through the atmosphere and top of atmosphere. It also comes from a range of different sources. There are papers describing site-specific albedo (eg from specific locations in the Arctic and Antarctica). Papers examining albedo at the poles. And other papers that take a view across the whole of earth. 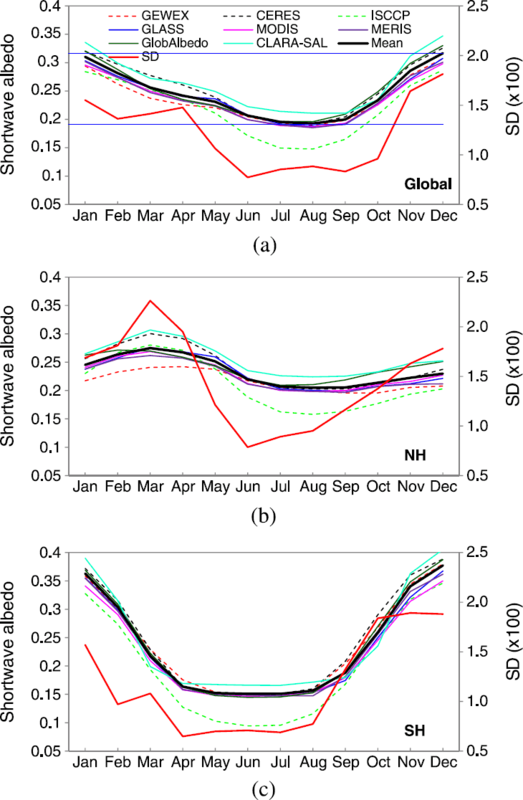 The observed seasonal evolution of albedo has been shown to increase throughout the winter, peaking in March on average in the Northern Hemisphere (NH) [Fang et al., 2007; He et al., 2014]. He et al. suggested that this late winter maximum albedo is due to weak insolation during winter and the increasing influence of snow and ice-covered surfaces on the shortwave radiation budget during the winter-to-spring transition. This peak albedo is strongly tied to land cover, with forested regions being the least reflective, even with high snow cover, because the forest canopy masks the surface [Jin et al., 2002; Barlage et al., 2005; Fang et al., 2007]. It is interesting to ﬁnd that the mean surface albedo for the Northern Hemisphere peaks in March (Figure 2b). This can be explained by the fact that high-latitude regions on the Northern Hemisphere receive little amount of downward solar radiation(<5Wm-2) in winter. Consequently, strongly reﬂective surfaces common to these latitudes, such as snow and ice, do not actively contribute to the shortwave radiation budget. From winter to spring, increasingly high surface albedos are observed, because snow and ice contribute to the radiation budget more and more as a result of increasing exposure to sunlight. Globally, it shows the highest surface albedo is in December and the lowest from June to December. The highest surface albedo in the northern hemisphere is in March. In the southern hemisphere it's highest in December, which is the time when there is most sunlight. So despite the fact that the southern hemisphere has a lot more open ocean (therefore low albedo), I can only guess that it's down to reflections from Antarctica. I would have added the southern monsoon clouds except that this is just surface albedo that's being talked about. We find that the Arctic planetary albedo has decreased from 0.52 to 0.48 between 1979 and 2011, corresponding to an additional 6.4 ± 0.9 W/m2 of solar energy input into the Arctic Ocean region since 1979. Averaged over the globe, this albedo decrease corresponds to a forcing that is 25% as large as that due to the change in CO2 during this period, considerably larger than expectations from models and other less direct recent estimates. Changes in cloudiness appear to play a negligible role in observed Arctic darkening, thus reducing the possibility of Arctic cloud albedo feedbacks mitigating future Arctic warming. As explained above, based on astronomical calculations Earth’s two hemispheres receive equal amounts of 87.4 PW of energy from the sun. Part of this radiation is reflected back to space by clouds in the atmosphere and by the surface itself, quantified by the planet’s albedo of about 30%. According to the CERES-FT08 dataset, the reflected energy flows are 26.0 and 26.1 PW for the Northern and Southern Hemisphere, respectively (see Table 2). The slightly larger total albedo of the Southern Hemisphere is caused by several factors. To begin with, the Southern Hemisphere reflects more radiation back to space due to a larger annual fraction of low clouds, which dominate the cloud–albedo effect (Hartmann et al. 1992). Indeed, for the time period 1961–90, the ERA-40 (Uppala et al. 2005) reanalysis dataset yields annually averaged low cloud cover fractions of 0.31 and 0.38 for the Northern and Southern Hemisphere, respectively, and the CERES-FT08 data show that the amount of radiation reflected by the Southern Hemisphere is larger by about 1.7 PW due to this. This higher atmospheric albedo in the SH is almost balanced by the lower surface albedo due to the larger area covered by oceans in the Southern Hemisphere, however. In the CERES-FT08 data, the surface in the Northern Hemisphere reflects roughly 1.6 PW more radiation than in the Southern Hemisphere due to this effect. The higher average albedo of the Antarctic, which is often mentioned as one potential reason for the hemispheric temperature difference, plays a role here but obviously cannot compensate for the larger and comparatively dark areas of ocean in the SH. The combined effect of meridional transport of heat in the oceans and albedo differences between the Antarctic and the Arctic therefore is the main cause of the warmer Northern Hemisphere, but the discussion also highlights that much remains to be done to improve our understanding of Earth’s energy budget, a task appearing even more important in today’s changing climate. Even if he was talking about the surface, in the northern hemisphere, Willis has it wrong. It's March when the surface albedo is the highest, not December. At least according to much of the literature. He's also wrong about "mostly ice free zones" in March and September. There is lots of snow and ice at the equinoxes. In March the Arctic sea ice is at its maximum, and the extent of snow cover in the northern hemisphere is about the same at the beginning of March as it is at the December solstice. 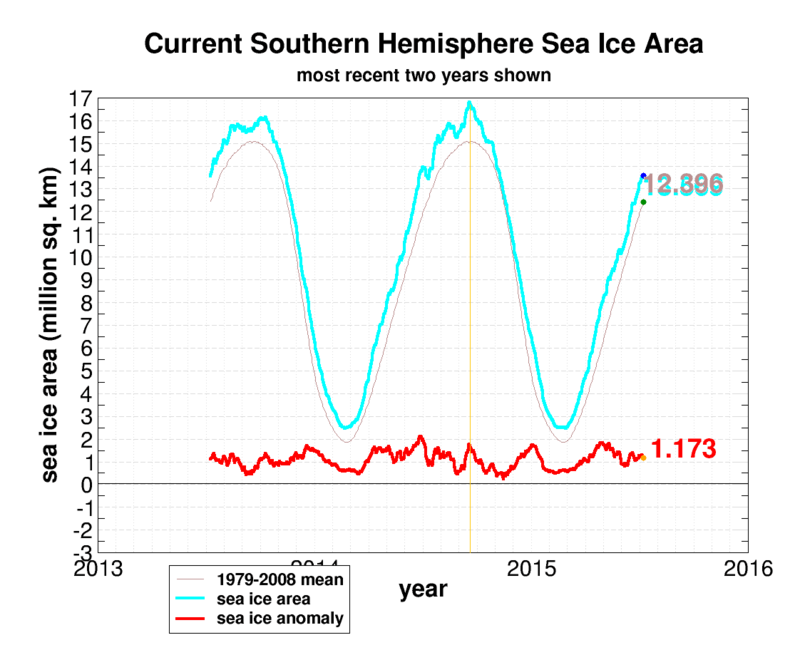 In September Antarctic sea ice is at its maximum. Peter Webster's response to Willis and Judith's "profound"
ATTP had an article about it too. He thought it a solid paper, but wasn't so impressed as to call it profound. I haven't read all the comments at either place but I didn't see any discussion about whether the interannual albedo representation is right or wrong. Anyway, I decided to do some investigating of my own. One thing I found interesting is that Willis goes to great lengths to excuse one of the co-authors, Peter Webster (of Curry and Webster) from any responsibility for the paper. I've no idea what contribution Peter made, but he didn't seem to have an answer to Willis' concern. Yet I'd say that Willis' concern was fundamental to the paper. Willis approached Peter Webster, who passed the buck to the lead author, Graham Stephens. Then when there was no response from Dr Stephens, Peter suggested Willis go ahead an publish. Willis didn't want to go to the bother of doing that. Instead he wrote about his concern at WUWT (and complained long and loud that he didn't get a response from Dr Stephens - implying his WUWT article was payback.) Willis' self-righteous rant starts about here. It looks to me that it was Pat Frank who got it wrong, not Graeme Stephens. A couple of years ago, I discovered a decimal mistake in the RMS uncertainty in the TOA budget in Figure 1 of Graeme Stephens’ 2012 paper, “An update on Earth’s energy balance in light of the latest global observations” Nature Geosci. 5, 691. It’s written as ±0.4 Wm^-2, but should be 4 Wm^-2 (making the TOA imbalance a very definitive 0.6±4 Wm^-2). I wrote two polite emails to Dr. Stephens asking him about this, but he never replied. So, don’t take his silence personally, Willis. It may be his policy to not reply to polite critical emails. The solar flux entering Earth is the most-accurately monitored of all fluxes through the system and varies least over time. Fluxes leaving Earth at the TOA are also well documented, although inherently less accurate with an uncertainty of ±4 Wm–2 on the net TOA flux that mostly stems from calibration errors on measurements of the outgoing fluxes. This uncertainty is almost an order of magnitude larger than the imbalance of 0.58 ±0.4 Wm–2 inferred from OHC information. The outgoing TOA fluxes presented in Fig. B1 are the TOA CERES fluxes adjusted within the measurement uncertainty to match this OHC inferred imbalance. Thanks for an interesting question, richard. The albedo peaks represent some kind of mix of winter snow, winter ice, winter clouds, and solar angle. We know when it peaks, so I fear that theories about when it should peak are only as good as their ability to match observations. I fear that your theory doesn’t do that well given that it predicts a peak in late January. I’ve never seen any estimate of the albedo that peaked in late January, regardless of the source. I couldn’t say why that is … I can only report the observations. From the HotWhopper archives: Wondering Willis Eschenbach looks for sunlight in the Arctic winter - yeah, really! Below are the references I used in this article. I looked at others as well. If it's not listed below it doesn't mean it wasn't any good. Quite the contrary. I've started to compile a longer list of references that I looked at, which you can see in a new page on the static HotWhopper site here. (I'll be adding more during the day.) Then of course there's the citations at the end of every paper. If you haven't thought much about albedo, rest assured, the scientists have. He, Tao, Shunlin Liang, and Dan‐Xia Song. "Analysis of global land surface albedo climatology and spatial‐temporal variation during 1981–2010 from multiple satellite products." Journal of Geophysical Research: Atmospheres 119, no. 17 (2014): 10-281. DOI: 10.1002/2014JD021667 (pdf here) - Note: This paper gives a description of the various satellites used to calculate measures of albedo. I had a quick read of the Stephens et al paper, it looked fine to me. The albedo chart does look different to others I have seen, but not a lot different. The effect they are studying is small, and others have said the CERES measurements are uncertain. I'm quite sure Willis has been caught out on this before. You know, neglecting to notice that the Arctic is dark for a large portion of winter. That pretty much blows his argument straight out of the water. And, of course, this was pointed out to him before the first time he made this mistake. Maybe we should call this sort of behaviour the Goldfish Gambit. Now, to start with they’ve done something strange. Rather than look at the changes over the whole year, they’ve only looked at three months of the year, June, July, and August. Its dark in the Arctic in winter time. Good luck looking for changes in reflected light in perpetual darkness. The other thing I noticed is that Willis does not say how he calculated his albedo - as far as I am aware the CERES data does not include albedo. I don't think Willis ever read the manual, Harry. AFAIK you're correct. IIRC the short wave radiation is calculated by what's left after removing the long wave from TOA all radiation. That article also looks at why the short wave radiation is similar in both hemispheres. (Like this article here). And the Encyclopedia of Climate is for only one year (2010), so I was surprised at the excellent match Willis got averaging 14 years considering the CERES data is all over the place, it varies a lot year to year. It's worth noting the comment of Mike M. He's one of the few scientifically knowledgeable folk there. I wondered what is happening. It's hard to imagine that it is a mistake; Graeme Stephens has worked with this over his whole career. It's a major review paper, with senior co-authors. And it isn't a slip - they break down the variation into components, and give explanations, which are at variance to Willis'. I don't think though that the geometric albedo idea of Mike M pans out. The paper never refers to the distinction, but it fairly often refers to the Earth's albedo at 0.29, which is Bond (geometric is about 0.36). Incidentally, Graeme S and Peter W were both with CSIRO at Aspendale in the 1980's. Peter is from Melbourne. I didn't know him then, but I did do some work with Graeme. He's a first-rate scientist. I'll be interested to see how it works out. One gets (I get) exactly 3 hits, all pointing to the main paper mentioned above. So, if WE isn't using that particular dataset then ... wait for it ... go figure. If WE isn't using equations (1 thru 6b) from Stephens15 then ... wait for it ... go figure (doesn't have too, but one hopes that if one wants to reproduce another's work one would follow their derivation/definition). D'oh! If WE is scared to actually submit a formal reply to the journal, which appears, at least to me, to be the rather obvious case (for fear of being labeled an incompetent DK'er) then ... wait for it ... go figure. I suspect "albedo" and "TOA albedo" are different things. Willis calculates TOA albedo. Encyclopedia of Climate calculates TOA albedo (I managed to duplicate their results for 2010 using CERES data. TOA albedo appears to be the ratio of outgoing shortwave flux divided by the incoming solar flux.